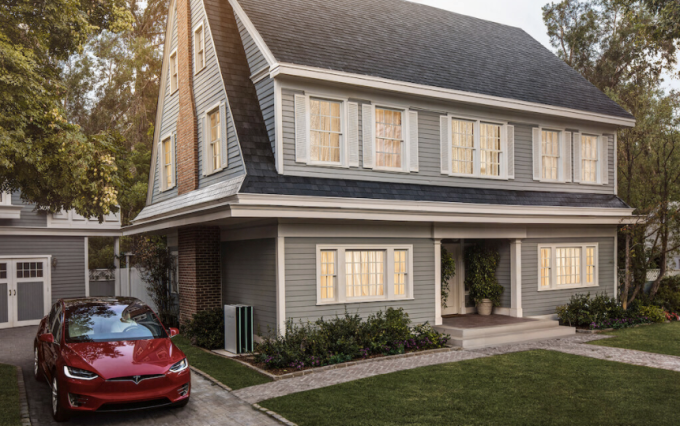 The Low-Down: How Much Will Tesla's Solar Roof Tiles Actually Cost? How Much Will Tesla's Solar Roof Tiles Actually Cost? It will probably not surprise you to learn that the answer is. 'it depends.' On location, roof size and related factors. Tesla is tapping Google’s Project Sunroof , which uses some 3D mapping to give them a rough idea of how much roof area (square footage) you’ve got, and how much of it is actually good for solar use. That gives them an estimate for the roof cost (including materials, installation and the cost of removing your old roof), at which point they factor in the cost of a Powerwall battery. Then they wrap in offsets like local tax credits and the money saved on your electric bill to give you a final cost after 30 years. Tesla is tapping Google’s Project Sunroof , which uses some 3D mapping trickery to give them a rough idea of how much roof area (square footage) you’ve got, and how much of it is actually good for solar use. That gives them a ballpark estimate for the roof cost (including materials, installation and the cost of removing your old roof), at which point they factor in the cost of a Powerwall battery. Then they wrap in offsets like local tax credits and the money saved on your electric bill to give you a final cost after 30 years.